This recipe for Savory Scones with Zucchini, Feta and Thyme is a surprising way to use up garden zucchini! Savor it with soup for a comforting meal. I spent some time last week doing a deep-clean purge of my cabinets. Bottles and bottles of nail polish, nearly empty tubes of lotion, too many samples of makeup — into the garbage it all went, and with each reorganized drawer, I felt a sense of calm and accomplishment. It’s unclear to me if this purge was motivated by the need to nest or if I was procrastinating from work, but even if it were the latter, it was good procrastination, because it was much overdue! Or maybe it is my own way to start transitioning from summer to fall – now that my drawers are organized, it’s time to start thinking about my closet, too. In the kitchen, I’m feeling the transition, too. Part of me wants to hold on to all the summer fruits and vegetables, and the other part of me wants to head into cozy sweater food, the kind you want to eat wrapped up in a fluffy sweater, the kind where the sleeves are long on purpose, so that you can tuck your hands in when it gets chilly, even indoors. I can’t even tell you much I’ve baked in the last two weeks — the baking bug has certainly bitten, and I’ve been making cakes and muffins, and of course, scones. 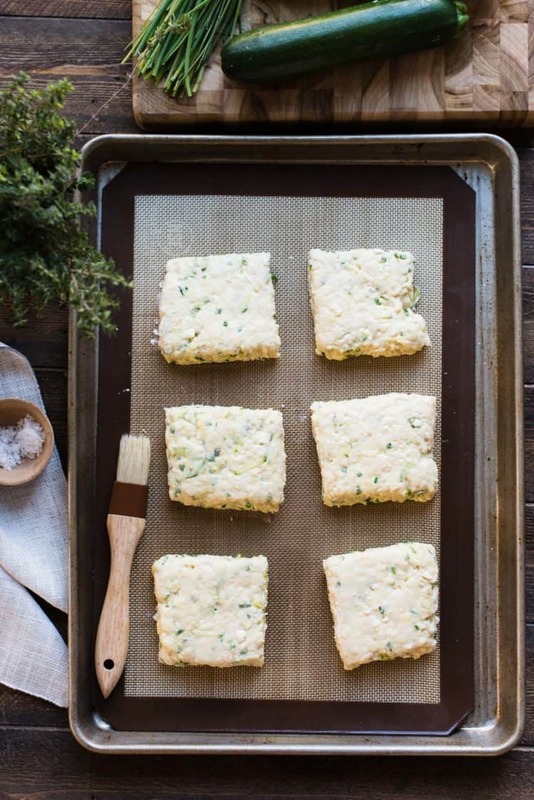 With one foot in summer and the other in fall, these Savory Zucchini Scones with Feta and Thyme are my answer to those days when you wake up to chilly mornings, and you know you need to turn the oven on early before it gets hot by midday again. 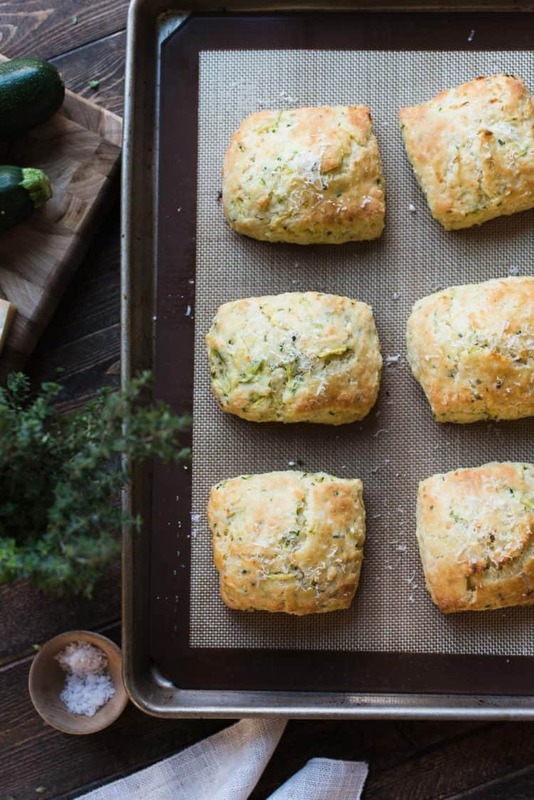 I still have lots of zucchini in my fridge and I wanted a savory scone recipe that would taste of summer, but be cozy and comforting, too. Purging the zucchini into scones turned into a very good idea. Even better, it went perfectly with a bowl of roasted tomato soup (recipe coming up next!) – my son agreed that it was like a grown-up grilled cheese sandwich when eaten this way. And I’ve decided that procrastinating can be a good thing…especially if scones are involved. 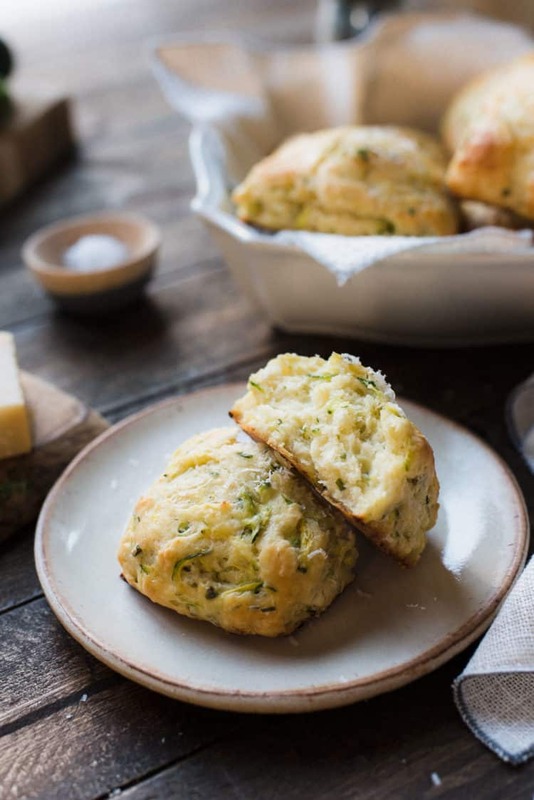 These savory scones with zucchini and cheese are delicious on their own, but are especially good with a tomato soup, perfect for those chilly nights as we head into fall! Place the shredded zucchini between a few layers of paper towels and squeeze to remove excess moisture. 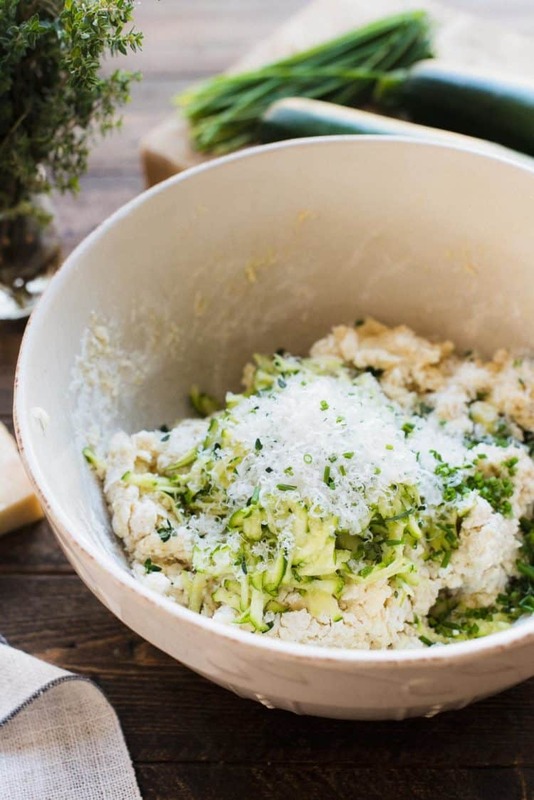 In a small bowl, mix together the zucchini, feta, parmesan, thyme, and chives. Add this to the batter, then mix lightly. The dough will be sticky. On a floured surface, turn the sticky dough out and knead lightly until all the cheese, zucchini and herbs are incorporated into the dough. Dust with flour, as needed, if the dough feels too wet. Roll the dough 3/4-inch thick rectangle, about 6"x9". Cut out 3-inch squares. You should have about 6 scones. Place the scones on a baking sheet lined with parchment or a silicone mat, and lightly brush with buttermilk. Sprinkle with sea salt. Place the scones in the freezer for 30 minutes. Meanwhile, preheat the oven to 400° F.
Once the scones are chilled, bake for 20 minutes, or until golden. Sprinkle with additional parmesan cheese and serve warm. 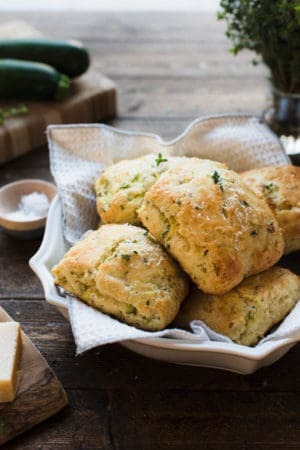 Adapted from Cheddar-Dill Scones in The Barefoot Contessa Cookbook by Ina Garten. Thank you SO much, Rebecca! If you ever have some zucchini on hand, you have to try it! Very nice recipe and going to surely make it.